I first came across the Ajanta caves when I was seventeen, living with a somewhat difficult host family in a large town north of Tokyo. My days were spent at an all-girls school, nominally Catholic, though few of its attendees actually were. In an effort to avoid science and maths (which I had dropped in NZ), I convinced my sensei that I needed extra time to study kanji, and thus spent several hours a week unsupervised in the school’s library. At the rear of the library was a tiny storeroom, which contained a treasure trove of faded English-language novels (this being pre-internet, any English print was a rare treat). Among the complete sets of Sherlock Holmes and Shakespeare abandoned by the foreign missionaries who had formerly run the school was a book of poetry which included a poem by the American wartime poet, Muriel Ruykeyser, called “Ajanta”. I was going through a phase of being obsessed with the music of The Doors, and the poem was of a similarly trippy vein – all “I came alone to the midnight caves”, very mysterious and portentous. Anyway. I grew up and got over myself (mostly), but something about the Ajanta caves stuck, and when I discovered that they were a mere 8 hour train ride from Mumbai (in a country where a decent train journey could take 36 hours and still not reach the end), I decided I had to see them for myself. 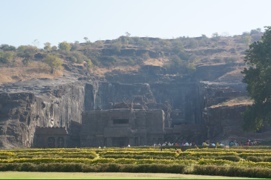 Unfortunately, India being India, the Ajanta caves are closed on the day I arrive in Aurangabad, so I have to settle first for the “alternative” caves at Ellora instead. 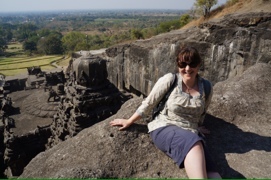 Between my English version of Lonely Planet and Alizé’s French one, it looks as though Ellora, only 30km from Aurangabad, could be reached by rickshaw, significantly cheaper than a taxi or rented car, and considerably more comfortable (and more fun!) than the government bus, which was overcrowded and underventilated. As luck would have it, the rickshaw driver who brings Alizé from her hotel to mine the next morning speaks pretty good English, and is only too happy to take us to Ellora for the day, for about the price that my car from the train station had cost the night before. For a total of 750INR, he will wait as long as we want, and take us anywhere else we want to go for the day. I suspect we could have bargained harder, but might have found ourselves making a few more unwanted diversions to local “sights” where he could reclaim some of the fare by way of commission. Aman turns out to be a bit of a character, and keeps us entertained with a running commentary all the way to the caves, weaving in and out of traffic and making liberal use of a large bronze horn on the side of the rickshaw that wouldn’t have looked out of place on Chitty Chitty Bang Bang. We dodge herds of goats, garishly decorated trucks, little white Tata nanos (the cheapest new car in the world, a mere £1000 new, but only available in India), bicycles and innumerable motorbikes, most with a male driver and a female pillion passenger perched sidesaddle behind, carrying bags, babies or both. 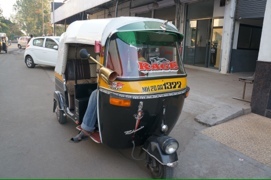 Aman informs us that the traffic has grown considerably worse in the last five years as more people are able to afford motorbikes – and the traffic in Aurangabad is noticeably worse than Mumbai – with a haze of pollution to match. I’d be interested to know what the rates of respiratory disease are, I’m pretty sure I have lost a year or two of my life just driving around for two days. An hour later we arrive at Ellora, pay the “foreigner price” for our tickets (250INR, vs 10INR – which, given the relative income discrepancy, seems not unfair), and fend off the postcard, map, jewellery and crystal vendors to make our way to the entrance. 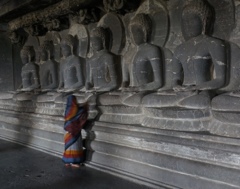 In many ways the Ellora caves are more impressive than Ajanta (of which, more in the next post). There are three sets of caves, nearly all containing sculptures. The oldest are the Buddhist caves (dating back to 200 years BCE), the most elaborate are the Hindu caves, while the Jain caves are the least visited, being a bit further removed (and remained unvisited by us, I’m afraid to say, from sheer exhaustion). 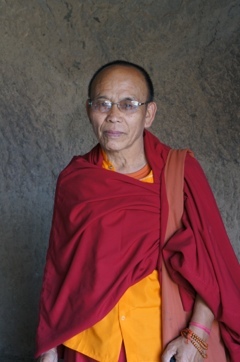 We begin with the Buddhist caves, where we discover several groups of pilgrims – Buddhist monks in red robes, and two groups who have travelled down from Nepal by bus, and are fully kitted out in their warmest national dress (this, supposedly, being winter – a mere 30 degrees). What is amazing about the caves is that they and the sculptures within them are monolithic, carved from the side of the cliff from top to bottom and from front to back in a single piece – with little room for error, and with only hammers and chisels for tools (the chisel marks still clearly visible in some of the caves). The caves were originally designed as retreats for use during the monsoon, some plain meditation rooms surrounded by tiny cells, 7′ by 7′, and others containing huge statues of Buddha. I am admonished in one cave by the guard for setting up my little tripod – apparently a special permit is needed (you need one for video cameras too, though not for still – the IAS apparently not having caught up with the fact that most cameras these days can shoot video too). He taps his nose and leads me to a corner – I can use the tripod but if his supervisor comes, must say I didn’t understand when he’d told me not to. He then takes us on an unofficial tour of the cave, explaining the two main types of Buddhism – according to our guide, for the first few hundred years, there were no images of Buddha, his teaching being that one should aim for one’s own enlightenment, and not worship Buddha himself. Then there was a split, and Mahayana Buddhists now worship statues of Buddha while Himayana Buddhists don’t, but use stupas instead. Or something along those lines. Our guide waits for the cave to clear, before demonstrating the amazing harmonic echoes in the cave by chanting directly into one of the columns. The effect is eerie. Coming out of the cave, we are drawn to another a little further along, from which a low murmur can be heard. Removing our shoes and slipping inside, we come across one of the Nepali groups seated in front of a large statue of Buddha (i guess they are Mahayana, then), as a monk leads them through the sutras. As I watch, it is easy to imagine the caves as they had been when occupied by their original inhabitants a few hundred years ago. The spell is broken by two young boys, also dressed in monkish garb, for whom the chanting has clearly gone on long enough. 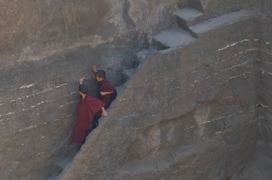 They are escorted outside, and I later find one of the older monks helping them to blow off steam in the time-honoured way, by timing them as they race up a long stone staircase. By the time we emerge from the last of the Buddhist caves, the sun is high and hot, and we agree to continue to explore after lunch. There is a dingy little official restaurant to one side, almost deserted. The site by now is swarming with bus loads of Indian tourists, most of whom have brought picnics. For about 80INR I order a veg thali, a tray with two non-descript veg curries, raita, a sharp lime pickle and a couple of chapatti. Another 30INR secures a fresh lime soda, my new favourite drink – fresh lime juice squeezed into a glass, served with a glass bottle of soda water which the waiter opens at the table. It comes sweet (with sugar syrup on the side), salty or plain, and is utterly delicious. I think I’m beginning to get the hang of eating right-handed, though I still have to practically sit on my left hand so I don’t use it by mistake. Duly refreshed, we start on the second leg. The Kailasa temple is one of the most magnificent sights at Ellora, a giant temple carved from the rock, replete with elephants and dancing figures, and the ever present shiva linga. 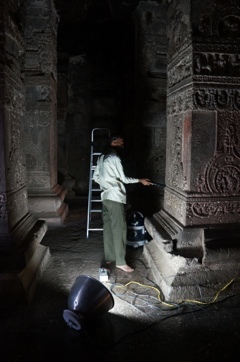 The temple itself is still used for worship, and the scent of incense lingers in some of the dark caverns, so I’m surprised to turn a corner and find bright spotlights and ladders set up, while a man in overalls is busy vacuum cleaning the crevices of a pillar – restoration, Indian Archaeological Survey-style. The temple is crammed with tourists and pilgrims, and after a while we tire of the requests for “one photo, one photo!” – I suggest to one that the first photo is free, but after that I charge 10 rupees. A little more weird (and occasionally creepy) are the guys who try to take sneaky pics with their mobiles. The best view of the temple is from above, so we escape the crowds and climb the path to one side and up the cliff behind, to look down on the complex. No safety rails (health and safety remains largely a foreign concept), but an intrepid jewellery-seller does his best to encourage us to take the safest paths, in the hope that he might make a sale, continuing even when we assure him in no uncertain terms that we don’t need any today, thanks. At the top, coming around the steepest part we meet the Nepalese pilgrims again. We are hot, sweaty and tired – they are wearing wool and look like they’re just taking a little stroll. It’s late in the afternoon now, so we decide to skip the Jain caves so that we’ll have time to make one last stop on the return trip to Aurangabad. 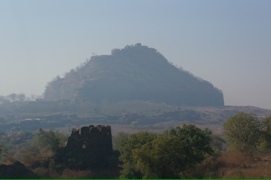 We passed the Daulatabad Fort on the way this morning, high on a solitary hilltop, and it looks like it’s worth further investigation. 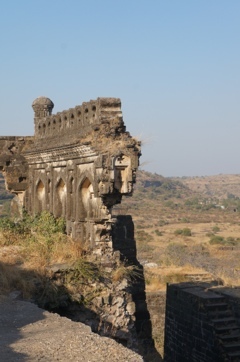 The story of Daulatabad fort is an interesting one. Settled in the 6th century, it was used in the 1100s by the kings who created the Kailash temple, and named Deogiri. In 1327 the sultan of Delhi (one Mohammed bin Tughluq) took a liking to the place, and decided to make it his new capital. He renamed it Daulatabad Fort and forced the entire population of Delhi to march there. 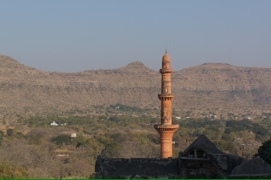 Not a man to bother with small details like due diligence, it soon turned out that he had overlooked the small fact that Daulatabad did not have a sufficient water supply for its new population. A couple of years after they arrived, his long-suffering subjects were marched right back to Delhi. Or so the story goes. We arrive an hour before closing time, and everyone else is walking down the old flagstoned road towards the exit. The road reminds me of the roman roads at Pompeii. The fort itself is now a ruin, save for a single tall tower and some ramparts – it could be a ruined castle in any part of Europe, save for the distinctive Mughal-style arches, and a distinct lack of safety barriers. The peak of the fort is reached through the Andheri passage, a twisting, convoluted passage with false turns leading directly to the moat (down which boiling oil could be poured if the fort were under attack), and a large population of bats. When we arrive, a group of young Indian men are daring each other to enter – I think they are slightly taken aback when we walk directly past them, as they quickly band together, summon their courage and run giggling and screaming past us. I have a head torch, Alizé has the light of her mobile – but from the volume of guano on the ground and the high pitched tweets not very far above our heads, I think the less we can see the better. The path is steep but not very long, and we emerge into the sun again to find a group or women in elaborate saris gathered to ask us for “one photo” at the top – they have taken the “tourist route”, a set of steps recently added for those not inclined to brave the batcave. We stand as close to the crumbling edge as we dare, then make our way down to our patient rickshaw driver as the sun begins to set. 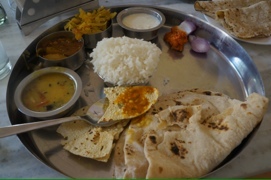 We arrive back in Aurangabad in a cloud of exhaust fumes and take Aman’s recommendation of a local tandoori place – which, we discover on arrival, is clearly aimed at tourists – but it’s cheap, and the food is good (Alizé checks carefully to make sure the chicken is cooked right through). Tomorrow we will make another attempt on Ajanta. I’ll post some pictures on smugmug just as soon as I have enough broadband (I’m finding it easy enough to transfer photos to my iPad, but uploading them to smugmug via iPad requires the smugshot app, which frankly ain’t the fastest, so bear with me). Loving the blog, makes me feel like I’m there with you (though you somehow seem to fit so much more into a day than me)! Loved my awesome 3D panda bday postcard thanks, and it arrived within 12 hrs of the date! Look forward to hearing more (and hope you stay bug-free).